Cleaning techniques are good to follow as cleaning your house is one of the daily activities that everyone has to do. Keeping your space as clean as possible can help you avoid from sickness and allergies. 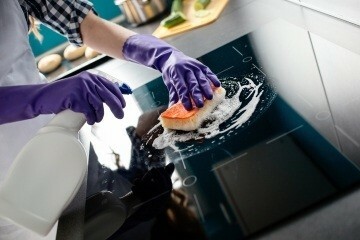 Although it may take a lot of energy to do the cleaning, many have to endure and enjoy doing it as a form of exercise. Cleaning your home can be a troublesome task. It is not easy without effective cleaning techniques that you follow every time you do this activity. In some cases, you might need some good cleaning equipment in order to work effectively. The right cleaning equipment or some green cleaning solutions can mean the difference between old and worn-out and shiny and new. It’s not just about the equipment itself, but it’s also about cleaning techniques you use. There are many of us who go beyond years before we learn the proper cleaning techniques for our home and floor. Most of the people have the hard time to make the grill non-stick. How many of us have the money for non-stick grilling pans or equipment? Not many of us do. We have to make use of what we have. One simple way to take care of it is to rub an onion on the surface of your grill. Yes, an onion! It will provide a non-stick cohesive. No matter what you cook outside, the food will not stick. Who knew something as simple as an onion would be so useful! One of the things we will be discussing is the cast-iron skillet. After so many uses, these skillets are going to get dirty and grimy especially if you use them a lot. Take some foam cleaner that is sometimes used for ovens and apply it. Cover it up for five days and let it soak. Let the cleaner work everything out. Do wear gloves when you do the cleaning, it can get rather caustic. This foam oven cleaner will get your skillet cleaned faster than anything else you have tried. You will walk into a brand new skillet after five days. Let’s take a look at the daunting task of cleaning the ovens. Our ovens go through a lot with the constant cooking and baking. Sometimes, even though the best intentions, some of us forget to use the foil. When this happens, we have to do our part to clean up the damage. One of the best things you can use is foam-free oven cleaner. It’s the ready-made kind. Just spray all around the insides and set the timer. It’s so simple and let the oven do its part. This way you won’t have to get down on your hands and knees and scrub. Scrubbing can take a lot of energy plus, you don’t always get all the nasty and dirty parts out by scrubbing alone. This is why you need the oven cleaner. That baby will go to town. Your oven will wind up looking brand-spanking new in no time. Many busy household have also tried to find some good cleaning service company that can do it instead of themselves. Due to their busy schedules, they have rather hire a cleaning service provider without realizing that they only need some cleaning equipment in order to work fast and effective. Many people who are busy can contact LynneJean Cleaning assistance with home cleaning.